The new Scottish Parliament building will house Scotland's first independent Parliament in nearly 300 years. The competition, won by Enric Miralles in 1998, was to select an architect to work with in developing the project, not for a finished design. The brief was still being developed recognizing that the client would change in 1999 when the new Parliament came into being. The site is located at the bottom of the Royal Mile in Edinburgh's Old Town, opposite the Royal Palace at Holyrood, next to Arthur's Seat and Salisbury Crags. Drawing inspiration from the surrounding landscape, the flower paintings by Charles Rennie Mackintosh and the upturned boats on the seashore for the roofs, Miralles developed a design that he said was a building "sitting in the land" . Seen in plan the Parliament is growing out of the site like a huge flower with the leaves forming the different structures. Structures covered with grass will run right up to the edge of the Debating Chamber building emphasizing the impression of the Parliament "sitting in the land". Garden paths and a series of ponds link all the buildings to the landscape around the four acre site. The complex will incorporate the Debating Chamber building, four Tower buildings containing committee rooms, briefing rooms and staff offices, the MSP building, the Cannongate buildings, a Media building and a large skylit Foyer. The Queensberry House, a 17th century "A" listed building located on the site, is being refurbished as part of the project. The MSP Building, housing 105 MSPs and their staff, is six storeys high at the north end, stepping down to four stories at the south end. The windows are stainless steel, framed in oak, with latice oak sunscreens on some of the windows. Each office, measuring 15 square meter, has a concrete barrel vault ceiling and built-in oak furnishing. The 18 ton vaulted ceilings, an important feature of the building, were cast off site and lifted into place. There are window seats for "contemplating" before going off to the Debating Chamber. The construction is a mixture of pre-cast and in-situ cast concrete units. Externally the building is clad in a mosaic of materials. Kemnay granite from Aberdeenshire is prominent and sits beside a darker granite from South Africa. Miralles liked the sparkle of the Kemnay granite. The leaf theme is repeated in a concrete wall on the west side of the building. A Lobby with twelve sweeping leaf shaped skylights will link all the buildings on the complex. Made from steel and glass these unique roof lights allow natural light to penetrate the space. The lobby will be an informal meeting space for MSPs and staff and the main thoroughfare for MSPs as they move from their offices to the Debating Chamber and Committee Rooms and it also links with the MSP and staff dining facilities. The frame of the Debating Chamber Building is predominantly steel, clad in high quality pre-cast concrete panels. A double line of tall, slender steel columns, incased in concrete, rises from the basement to support the floor of the debating chamber cantilevered out high above. The ground floor of the building is the main public space with reception, restaurant, Education Centre, shop and exhibition areas. From here you can access the public gallery of the chamber and committee rooms. The ceiling consists of three concrete vaults. Each vault was cast on site and features Enric Miralles' abstract designs of the saltire cross (the Scottish flag). All the exposed concrete in the building is so fine that it has a silky sheen to it. A lightwell in each of the three vaults allows natural light to penetrate the space.The flooring will be a mixture of Kemnay granite and Caithness stone. The floor of the chamber contains seating for 128 members, plus additional seats for the Lord Advocate and Solicitor General, in a semi-circular lay out. The Public, Press and Guest galleries are on the next level. At gallery level there are views out over the landscaping towards the Palace of Holyroodhouse and Salisbury Crags. The roof structure, of laminated oak beams and 111 stainless steel nodes (connecting joints), each slightly diffrent, is clearly visible from within the chamber. The Media Building, next to the Debating Chamber building. will be occupied by the Parliament's Broadcasting Office as well as journalists and external broadcasters, will contain the main public entrance to the complex where access will be controlled by Parliament security staff. Four Towers, containing the Parliament's 6 Committee Rooms, along with the offices of the staff who support the work of the Committees, wrap around the rear of the Debating Chamber Building. Members access to the chamber will be via a glazed corridor which connects with tower three. The shell of the buildings are made from reinforced concrete which was cast on-site. The upturned boat shaped roofs are covered in tern coated stainless steel. The 6 Committee Rooms, 2 large and 4 small, each have a vaulted ceiling. The Canongate Buildings situated next to Queensberry House at the foot of the Canongate, incorporates a new building as well as the construction of offices behind the existing facade. The facade of the Canongate Building is being retained along with the existing gables. The rest of that building has been demolished to make way for a new structure constructed of steel and concrete. The new building is of an impressive cantilever design. Supported at one end by a reinforced concrete structure the building spans approximately 18 metres without any supporting columns. The new building will house the Parliament's Information Technology staff and the Scottish Parliament Information Centre. Miralles was only 45 when he died, just a few month after construction started in 2000. 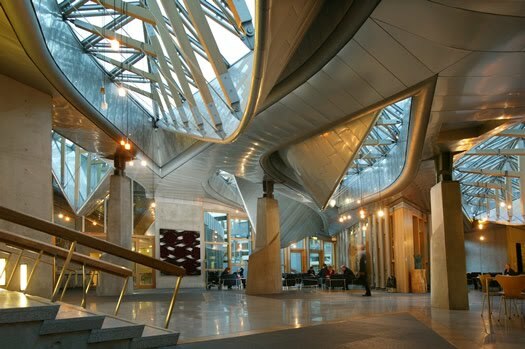 Donald Dewar who was Secretary of State for Scotland, and then First Minister in the devolved Scottish Parliament, chose the site and selected Miralles for the project that was to be the symbol of a new Scotland, also passed away in 2000. RMJM Scotland LTD, M.A.H. Duncan, T.B. Stewart.